This website is owned and operated by Devoti cc T/A The Sporting Rack. If you have any suggestions, comments or if you need to contact us, please email us using the link below. Making a purchase could not be easier. Browse the items in our store, and add any item into the shopping cart. After you have completed your selection of items that you require, click on the Checkout and you will be required to complete a couple of details that we need to be able to complete the order. Please pay by direct bank deposit or via EFT/Electronic Funds Transfer. Please send proof of payment through to our Sales Dept. The Sporting Rack reserves the right to cancel any credit card transaction at its own discretion. Orders are normally dispatched within 10 working days. For orders that are special manufactured requests, delivery will be confirmed once styling/design and artwork has been approved. Small packages will be sent via the post office registered mail service and larger items will be sent via courier. All deliveries will require a signature. Orders are normally received within 14 business days or sooner. Our delivery costs are designated on the basis of size, weight and destination. The best way to estimate what the delivery charge will be is to add all your items to your cart and begin the checkout process. The delivery cost will be added to your checkout automatically. Within the borders of South Africa approximate pricing: Counter to counter. Postage for parcels over 3 kg will be quoted accordingly. This applies to all retail shooting packs. The Sporting Rack uses Speed Services Couriers. Delivery to your local Post Office for collection. If you require a package sent to your door by courier, please do call us for a detailed quotation. All parcels are automatically insured. Parcels over 3kg will automatically be insured at a rate of R51.00 for the first kg and a further R4.00 per kg thereafter. If your item is not in stock, we will back order for you. You will always be emailed with the option to cancel if you would rather not wait. We guarantee all our work. All our Shooting Jackets and gun bags/slips come with a 30 day no quibble guarantee. Further, we can only extend the warranty provided by the manufacturer of the item listed. We offer your standard rights with regards to the consumer protection act. We will be happy to exchange items, which are returned to us within 7 days of purchase, providing they have not been used or worn. No refunds will be entertained. Please ensure you retain original Tax Invoice and original packaging. Please include a note with the full name and address of the person who placed the order. Please note that (unless the returns is due to fault or error on our side) we do not refund postage costs and postage will also be charged on any goods we send out in exchange. Your privacy is important to us. All information collected to complete orders will in no way be sold or shared with a 3rd party except to the extent of completing that order. Please don’t use our website if you do not agree with our terms and conditions. The images used to represent various products are a mere representation only of the actual item. The images are not meant to indicate actual items with regards to size, colour and fabric. Brand names/logo’s, when they do appear, are registered company names and belong to those company’s. The Sporting Rack will at no time be liable for any loss, damage or liability of whatsoever nature arising from the use of the website. 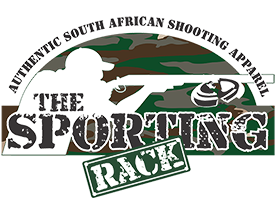 The Sporting Rack gives no guarantee that the site and its content are free from errors or omissions.